You simply have to love a place where a top local chef advises wine with breakfast. Thierry Marx, a Relais & Châteaux Grand Chef, reported to the Aquitaine tourism magazine that one of his personal favorite restaurants in the region was Lion d’Or, in Arcins, where "the owner knows the estuary well and all the best fishing spots. You can bring your own bottle, and order the hearty breakfast." I read this in the magazine upon my arrival in Bordeaux, as I sat at an outdoor café enjoying my first glass of a local rosé and small plate of assorted tapas. The waitress took my order while holding a lit cigarette (though she politely refrained from actually smoking it while at my table), a hunched-over old gypsy woman came ambling by with her outstretched tin cup, tables around me were full of people enjoying a two-hour, wine-laden lunch on a Wednesday afternoon, and a celebrated chef recommended bringing your own bottle of wine to breakfast. Ah, France…there is a reason you cast such a spell. The Aquitaine region is ancient, with the first recorded mention of the name in Caesar’s "Commentaries on the Gallic War." It was the Romans, in fact, who introduced the vine to Bordeaux around the first century, beginning more than two thousand years of a love affair with wine, food, and the "bon vivant" lifestyle that still predominates today. This lifestyle draws many people from around the world to visit, and many become so enchanted that they simply never leave. Such was the case for American artists Mike Snow and Tim White, who moved to Saussignac, in the Dordogne region about 100 kilometers east of Bordeaux, in 2005. Mike, a painter, and Tim, a photographer, relocated from Hawaii to move their artistic inspirations forward, along with personal political reasons. Their journey sounds like a fairy-tale movie script: they settled in Château de Saussignac, a romantic 15th century castle that is now divided into private homes for four separate owners. Here, their artwork comes to life in their château gallery, as well as the private lessons and artists retreats that they offer. Known locally as the Snow Whites, the pair was overwhelmed by the hospitality and friendship extended to them. "The people of the countryside of France are the most inviting and warmest people I have ever known," said Mike. "Everyone is your friend, stopping to say hello and give kisses on the cheek." Life is slower here, even by Hawaiian standards; the purchase of a baguette or book of stamps takes half an hour, as pleasantries are exchanged in places where everyone knows everyone else. "You will not find a fast food restaurant around here," Mike continued. "Instead you will find unique, creative and one of a kind experiences." 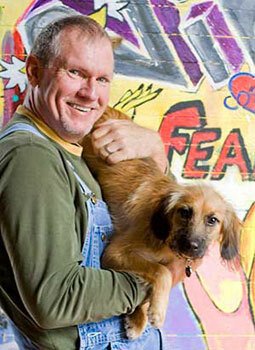 Mike provides some of these experiences, with his painting retreats held about three times a year with clients from around the world. "I don't teach people how to paint, I teach them how to open their minds, try new things and explore. I challenge them to move forward, to be more creative in the art form and style." Tim added that the beauty and history of the area is very inspiring to artists from all walks of life. "Whether it is the numerous châteaux in the region, the glorious sunflowers beloved by artists such as Picasso, or the pastoral landscapes of Southern France, this region of the world provides unique opportunities for a photographer." It’s true, I found. Even I couldn’t take a bad picture here, and my photography skills – not to mention my compact point-and-shoot camera – leave much to be desired. But the majesty of the castle, perched on its hill overlooking rolling green vineyards lit softly with the sun’s amber glow, proves an incomparable canvas. One of the vineyards below Château de Saussignac is Château Haut Garrigue, an organic wine farm run by Caroline and Sean Feely. The château has been a wine estate since the Middle Ages; the Feelys hail from Ireland and South Africa, and knew from the time they met 20 years ago that they wanted to be winemakers. "We both had a passion for wine," Caroline told me. The couple nearly bought a vineyard in Cape Town, where Sean’s grandfather also owned a vineyard; but Caroline’s job took them back to Dublin where they lived for the next eight years, making wine trips to France whenever possible. 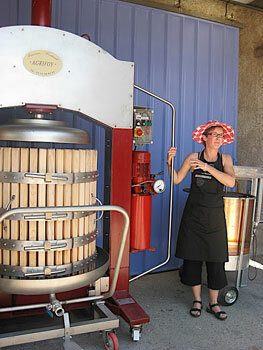 Caroline Feely demonstrates her winemaking equipment at Chateau Haut Garrigue. "We love France because there’s an incredibly deep and passionate history with wine," she said. "There are also the beautiful landscapes of vines, valleys and castles. Sometimes when I look out at our view and at Saussignac village I have to pinch myself to believe that we really do live and work in this place. It is magical." Like the Snow Whites, Caroline was amazed at the warm acceptance and assistance they received from neighbors. Just one month after purchasing the property, Sean cut his arm very badly while trimming the vines, and surgery followed. The couple had no idea how they would finish the work in order to harvest their first grapes; they were astounded when the surrounding farmers came in and completed the job. "For us the most important thing about this region is the people: their hearty and very real welcome," said Caroline. The Saussignac region as a whole shares the Feely’s commitment to organic farming. 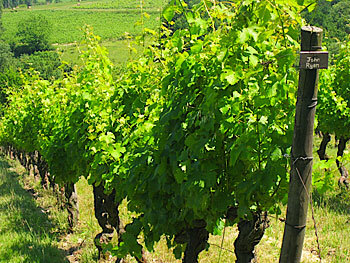 The area vineyards are 50% organic, compared to an overall average of 3% in France. "When we bought here, we didn’t know that," Caroline added. "Landing this place was a really big plus for us, because it means a great deal when the vines and soil right next to yours are also organic." She explained the benefits of organic wines for consumers: The higher natural acidity means that less sulfites are added for preservatives, as much as two-thirds less than conventional wines. Chemical use and over-pruning are traumas that inhibit the natural tendencies of the vines, causing them to defend themselves in a way that affects their flavor and production. "When you farm with chemicals, you encourage the roots to stay very shallow. With organic farming, the roots go much deeper, actually down into the bedrock. This greatly affects the flavor and quality." "The vines are really remarkable plants," she continued as she sat my group down at a picturesque spot for an outdoor luncheon, accompanied by four Château Haut Garrigue wines. From a sweet 2006 Saussignac dessert wine to a 2008 La Source barrel-aged white, I moved to the 2007 La Source Merlot/Cabernet and 2006 Merlot – delectable with a slice of organic dark chocolate. Last year the pair also started a Vine Share program, which allows direct participation from vine to wine. 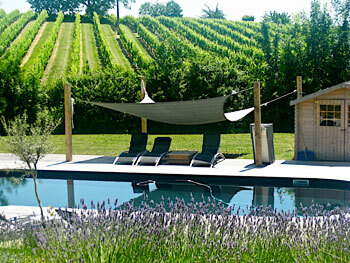 For 99 Euros per year, you get your own set of vines designated with your name, and a case of wine from your own grapes each year.The Feelys offer wine and food pairing lunches at their vineyard, as well as vineyard walks and picnics, wine courses, and overnight stays in one of their guest rooms. "It has been a voyage of discovery," Caroline said of the winemaking experience. "You don’t just do organic overnight; it takes time to understand and implement the processes. But we have learned that if you stick to your values and philosophies, it pays off." About 20 kilometers from Saussignac is Duras, another fairy-tale town complete with castle and medieval walls. Here you will find another duo of international transplants that have made this area their home. 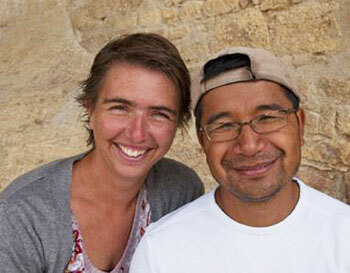 Sandra Alderden and Santi Bonnetisane are a delightful couple who exude positive energy. Santi came to France from Laos at the age of two, where he grew up and eventually became a Buddhist monk at age 22. Sandra is Dutch; her life took her on many paths until she ended up at the Buddhist monastery called Plum Village, nearby. It was at this monastery that Sandra met Santi, two like-minded souls who recognized each other immediately. After leaving the monastery, the couple went to work in Dublin; but they found it difficult to dive back into big-city life, and longed to return to Duras. "Our first wish was to go back to the countryside, where life goes slower," Sandra said. "These old-fashioned ways, and their purity, speak to our hearts." Two years ago, while visiting the area, they were driving down the road and saw a For Sale sign. Almost before the couple knew what had happened, they were the proud owners of several gorgeous rolling acres in wine country. But these two didn’t turn their property into a vineyard. Instead, they wanted to share their simple way of life with others, and determined to create an eco-friendly nature retreat. Simply Canvas was born, and is currently heading into its second season. 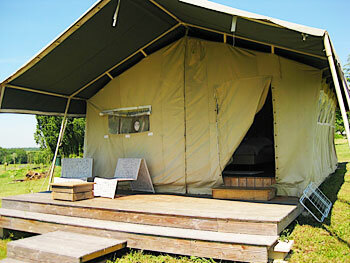 Here, Sandra and Santi offer six luxurious safari tents and a remodeled 19th century gite for rent, all decorated with either French traditional or Zen simplicity concepts. Here you can have as much privacy and silence as you want, strolling through the lavender fields or swimming in the naturally-filtered saltwater pool. You can also be as active as you want – not only do the nearby vineyards and historic town of Duras await your exploration, but Simply Canvas is also the site for family-oriented fun. The couple organizes activities from tree-planting, game days and music nights, to yoga retreats and women’s rejuvenation weeks. One aspect that I especially liked was their philosophy on supporting social causes. Santi and Sandra visited Laos several years ago, where they met a man who ran a non-profit helping street children. Since that time, they have supported two children’s organizations in Laos, and also invite their guests to donate toys or books that are shipped to Laos. "Making a living in the countryside takes time," said Sandra. "But it is pure, and here we are more at ease. People are very welcoming." "My takeaway coffee doesn’t come from a chain, but in a porcelain cup and saucer from the café around the corner. I bring it to my office, and then take it back to the café the next time." "I suppose in a way we have found an in-between life, from the silence of the monastery to bigger society." For an incredible vacation like no other, that is good for both the environment and your soul, slow down in the Bordeaux countryside, and see why these three couples have made it home. Atout France is the official guide to France, with helpful information and tours in Bordeaux and throughout the country. Bordeaux Tourism can help with details about the city, a UNESCO World Heritage site, and things to do in the region. Château de Saussignac Artists Retreats are week-long, hands-on learning experiences direct with the artists, starting at 1295 Euros including accommodations, meals and supplies. 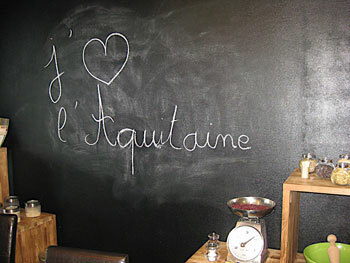 Château Haut Garrigue can be visited for an hour or a week; bottles start at 10 Euros and accommodations at € 350/week. 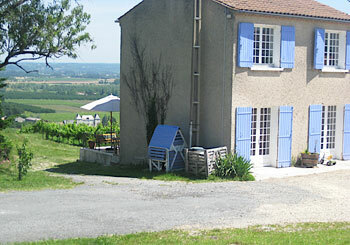 Also, check out their French Wine Adventures website for information on wine courses and tours. 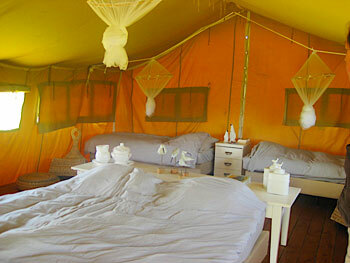 Simply Canvas rates run from 680-1450 Euros per week, including breakfast.